There is a common misconception that vegetarianism is a modern fad, but as early as 1807 in Britain the Reverend William Cowherd of Salford was advocating not eating meat. 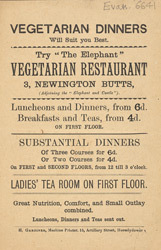 The Vegetarian Society was founded in 1847 and by the 1880s vegetarian restaurants were popular in London, offering cheap and nutritious meals in respectable settings. The sort of food available to most vegetarians then was quite plain and often choice was very limited. There was usually a vegetable soup to start, followed by a vegetable pie, with fruit to finish. Generalised abstinence was advocated for vegetarians at the time, and so water was the usual choice of beverage.